Chris Landry points out the D3 dust layer. On March 30, 2014, we measured 25.9” (657 mm) of SWE in our snow profile at the Grizzly Peak CODOS site on the west side of Loveland Pass, adjacent to Arapahoe Basin Ski Area. Our snow profile revealed the presence of dust event D3-WY2014 in a diffuse and weak band located 8-10” below the snowpack surface, with 95% of the snowcover SWE lying beneath D3. Dust layer D3 was not apparent at the snow surface in the locale. Dust layer D2 was also observed as a very weak and diffuse band a few inches below layer D3. As of April 3, the Grizzly Peak Snotel is reporting 144% of median Peak SWE, at 24.6”; the median date of Peak SWE is April 12. Overall, as of April 3, the combined Upper Colorado River Basin Snotel network is reporting 116% of median Peak SWE, a few weeks in advance of the range of dates of Peak SWE in that basin. Since our Grizzly Peak site visit, dust event D4-WY2014 fell onto the snowpack on March 30 with minimal accompanying snowfall covering it. Several inches of snow have fallen at this site in the past 24 hours, burying D4. Significant cold content remained in the snowpack in our snow profile at the high elevation site but exposure of layer D4 will accelerate the snowpack warming process toward isothermal temperatures (to 0.0° C throughout). Although the Snake River Near Montezuma hydrograph is not yet reporting data, streamflow is likely at or below median levels (as seen on the nearby Blue River Near Dillon gauge). Although additional snow is likely in the coming several days, dust layer D4 will eventually emerge close enough to the snowpack surface to begin absorbing solar radiation, accelerating the melt of the overlying snow and hastening the warming of the underlying snowcover. Onset of snowmelt discharge will begin as and when the snowpack becomes isothermal, starting at the lower elevations in the Summit County headwaters, and dust layers D4 (merged with D3 and D2) emerge and remain exposed during predicted dry weather. At 200 cm (78.7”), this snowpack was second only, in depth, to those observed in spring 2011 at the Grizzly Peak CODOS site. This high elevation snowpack presented some evidence of recent surface melting episodes but scant percolation of free water. Snowpack temperatures in this profile were still cold with a mean snow temperature of -3.2° C; at the observed temperatures the snowpack was entirely ‘dry’ (crumbles under pressure, without packing), with no moist (snowball snow) or wetter snow. On the morning of Sunday, March 30, dust layer D3-WY2014 was faintly visible in a diffuse band 8-10” below the snow surface. Dust layer D2 was also weakly present in another diffuse band just below a melt-freeze (polycrystal) crust underlying D3. Later that evening, dust layer D4 (March 30) fell onto the clean snow surface seen in this profile, with minimal fresh snow covering the new dust. Perhaps within hours the next day, D4 may have been extensively exposed and significantly reducing snow albedo until fresh snowfall beginning April 2 began to bury D4. Solar energy absorbed by layer D4 will need to melt about 1” of SWE before merging with layer D3, reducing snow albedo even further. During and after that merging process, melt water percolating downward from the dirty snow surface will hasten the warming of the snowpack toward isothermal. As of this writing on April 3, the Upper Colorado River Basin Snotel network is reporting 116% of median Peak SWE, as those sites approach their median Peak SWE dates. Within the framework of the “Snowmelt Runoff Scenarios” table above those SWE totals, as of April 1, place the watershed marginally within the “High Peak SWE” domain. Current dust conditions, including event D4, could be characterized as “Moderate” or slightly worse and, should the recent rate of dust-on-snow events continue, dust intensity certainly could attain “Heavy” before the end of snow season. As of this writing the comparatively high elevation snowcover in the Grizzly Peak and Loveland Pass locale retains significant cold content. 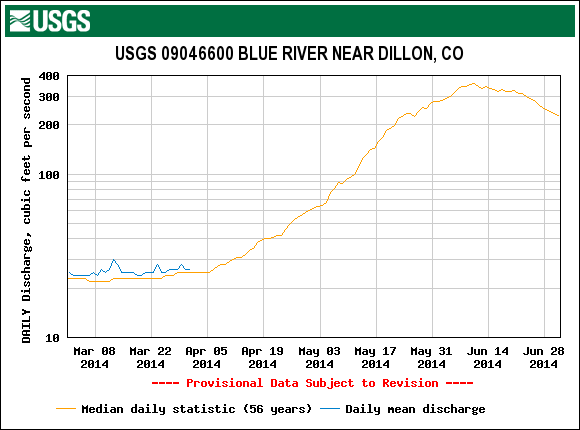 Although the Snake River Near Montezuma gauge is not yet reporting data, and is likely iced, the Blue River Near Dillon hydrograph reports below-median discharge levels to-date, similar to the early flows seen in spring 2008, another heavy snowpack year. Snake River flows are likely comparable to current Blue River levels, relative to the median. As always, spring weather will dictate the frequency and duration of dust exposure at the snowpack surface and the consequent impacts of reduced snow albedo on snowmelt runoff timing and rates. As of this writing (Thursday, April 3) it is currently snowing and additional accumulations are expected throughout the Colorado mountains over the coming weekend, burying dust layer D4 with more clean snow. A high pressure ridge and drier weather is expected to develop by the 8th or 9th. Given those near-term forecasts, further delay is likely in the onset of Snake River snowmelt runoff. Then, depending on its duration, and the depth of new snow above layer D4, the expected dry period in the 6-10 day projection may enable the exposure of dust layer D4, and merger with D3. That emergence would accelerate snowpack warming at higher elevations where it is not yet near isothermal and tip the scale at the lowest elevation snowcover that was near-isothermal. Given average spring weather, with a few additional snowfalls in April and May, early runoff in the Snake River watershed may resemble the ascending limb of the 2008 hydrograph, with erratic but strong surges to above-average peak flows a bit earlier than usual, followed by sustained above-average flows. If April and May remain drier than average, with prolonged periods of sunny weather and persistently low snow albedo values, very high snowmelt rates may sustain that initial surging to above-average (or well above) peak discharge at an even earlier-than-average date, as seen on the ascending limb of the Snake River 2009 hydrograph. See the Loveland Pass CODOS Site Reference Page for site details and an archive of site-specific reports.